A new exhibition at The University of Leeds (England) celebrates the work of American born and trained artist Mitzi Solomon Cunliffe. She was born January 1, 1918 and studied at the Art Students League of New York from 1930 to 1933 and then at Columbia University from 1935, where she received her M.A. in 1940. Read more about her life here. Mitzi Solomon was already beginning a notable career in America when she married historian Marcus Cunliffe in 1949, and moved to England, her home for the rest of her long life. I assume Solomon Cunliffe was Jewish by birth, or that at least her father (Abraham Solomon) was (if anyone knows for sure, let me know). She was one of small group of American women sculptors who contributed modern art to modern synagogues, something she seems ot have done only before her move to England. South Bend, Indiana. Temple Beth El. Mitzi Solomon Cunliffe, sculptor, 1947-1950. Photo: Temple Beth El website. Cunliffe contributed a striking relief to the entrance area of Temple Beth El in South Bend, Indiana in 1947. The synagogue, designed by architects Loebl, Schlossman and Bennett, was among the first modernist synagogues built after World War II. The relief represents the roots and branches of a tree, with the branches intertwined into an abstract design over which is laid a much smaller, narrow set of stone tablets of the Ten Commandments, inscribed with the first letters in Hebrew. In the words of Avram Kampf "It is quite possible that the artist attempted to evoke the sense and significance of the moral law at the roots of a civilized life and its specific places within the Hebraic tradition. "Significantly, Cunliffe's synagogue relief work is much less well known than contemporary (and later) works by Herbert Ferber and Ibram Lassaw, about which I have written before. The neglect is probably as much due to the location of the work in Indiana as to the artist's gender. 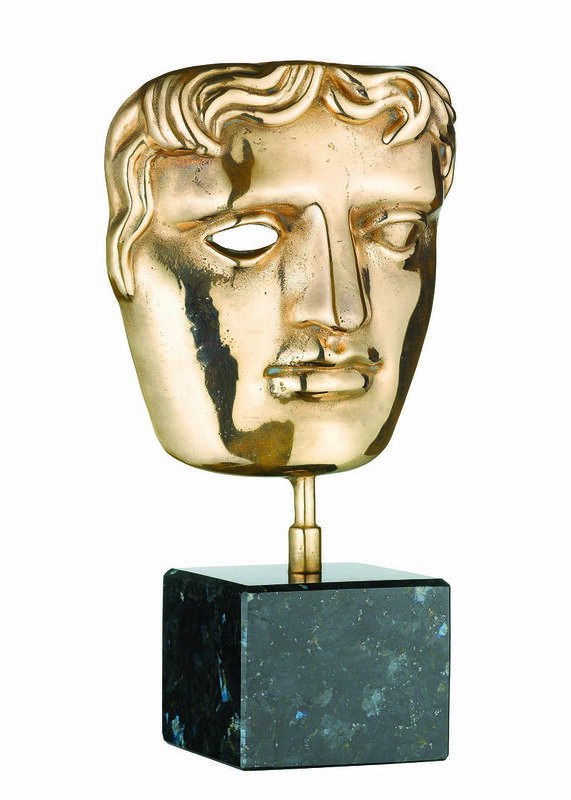 But Cunliffe's work pre-dates synagogue sculpture by Luise Kaish, Louise Nevelson and others by more than a decade. Mitzi Solomon Cunliffe continued to make art late in life, even as she suffered form Alzheimer's Disease. She died in 2006. Read her obituary in the Guardian here. 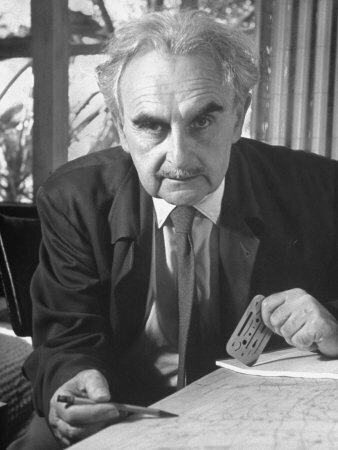 Today is the birthday of the great Austrian-born American modernist architect Richard Neutra. though not often remembered, Neutra's early career in Europe and America was very much a part of a broad Jewish modernist culture. Many of his artistic and architectural influences and his patrons came from the educated and artistic - and often experimental - Austrian and German-born Jewish intelligentsia of the interwar period, even - or especially - once he arrived in Southern California. There have been many fine books, exhibits and articles about Neutra's architecture, particularly his striking modernist houses which still delight, amaze and inspire today. In this post, I quote from a paper I gave at the College Art Association annual meeting in 2013 that addressed only some Jewish aspects of Neutra's work. This discussion was in the context of the careers and influence of about a dozen Jewish European immigrant and refugees architect to America. This passage deal with the Jewish world in which Neutra worked. Most important in history of synagogue architecture, however, is Neutra's 1924 synagogue design for the Vienna-Hietzing competition. though unbuilt it presage - a probably had a direct influence - on the preferred form of the post-World War II (often suburban) American synagogue center. For a more detailed examination of Neutra's work from the architectural perspective see Thomas S. Hines, Richard Neutra and the Search for Modern Architecture (New York & Oxford: Oxford University Press, 1982) and the MoMa catalogue by Hines and Arthur Drexler The Architecture of Richard Neutra: From International Style to California Modern, (NY: MoMA, 1982), and subsequent works by Sylvia Lavin, Barbara Lamprecht and others. "Richard Neutra had absorbed Wright's designs in Europe from the Wasmuth publication. 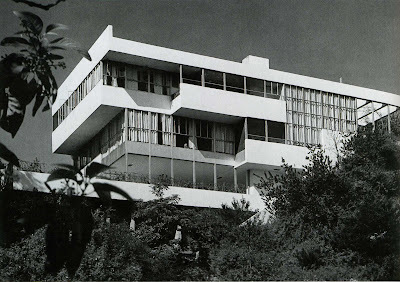 But Neutra had also worked in Berlin for the Expressionist Erich Mendelsohn, and with Mendelsohn had contacts as early as 1922 with Jewish clients when the two submitted a successful proposal for a commercial center in Haifa, Palestine. Almost immediately upon arriving in New York in 1923 – hoping to work, like Schindler, for Wright; Neutra was engaged by an International Zionist committee, including Albert Einstein, Rabbi Stephen Wise and Modechai Kaplan, to design a library for the new Hebrew University in Jerusalem. The audacious building, which combines elements of Wright and Mendelsohn, was promoted by the committee but never built. Richard Neutra. Unbuilt design for Jewish Library, Jerusalem, 1923. Drwg reproduced in The Architecture of Richard Neutra: From International Style to California Modern, (NY: MoMA, 1982), p. 34. Moving to Chicago, Neutra found a job with Holabird and Roche, but took creative work on the side for the North Shore Temple, designing a new building – without pay, but for the stimulation. 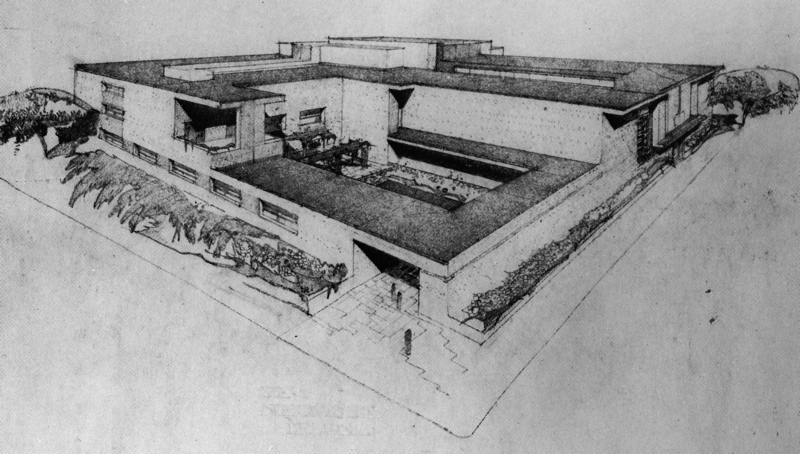 The unbuilt design, influenced by Wright, includes formal features not found in synagogues until the 1960s. In November 1924 he achieved his dream – and went to work with Wright at Taliesin. Sometime in this period he prepared the synagogue-center design submitted unsuccessfully to a Vienna competition. This also owes much to Wright and Mendelsohn, for whom Neutra was interpreter and liaison when Mendelsohn visited Taliesen for several days. 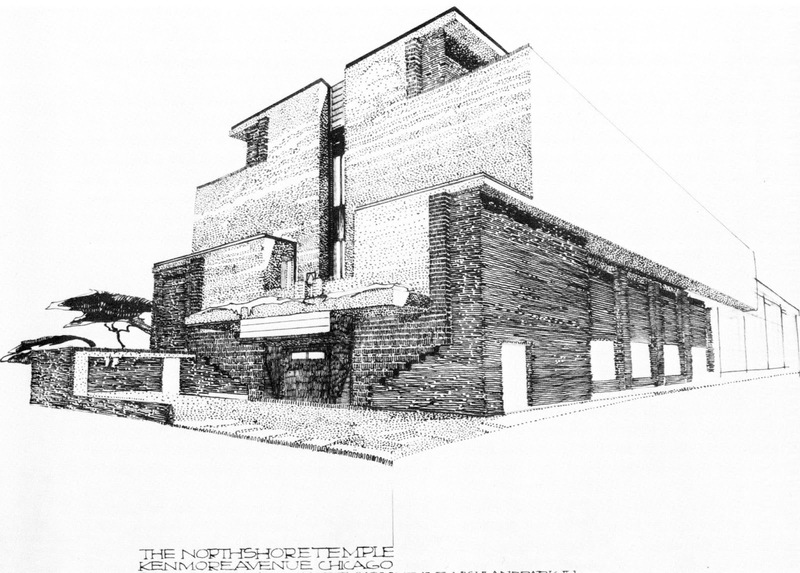 Neutra continued to play this role throughout his career, interpreting and blending ideas from the two masters. 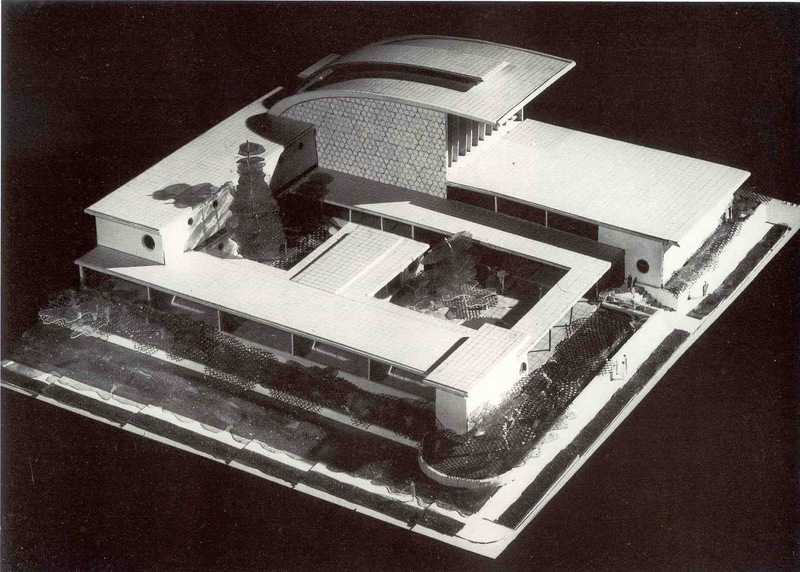 But even though many of Neutra's Jewish Center ideas were later picked up by other architects, including Mendelsohn, in America; none of the LA architects needed to, or chose to express, a strong Jewish identity. 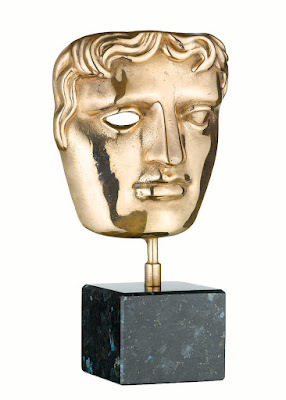 Maybe three rejections were enough for Neutra. Vienna-Hietzing competition, 1924. Richard Neutra project. Published in Menorah Nov-Dec 1929. St. Louis, MO. Bnai Amoona. Eric Mendelsohn, architect, 1949. Model. In any case, there is nothing Jewish implicit or explicit in their residential work. 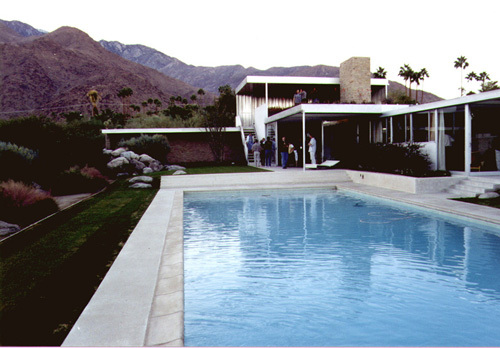 Still, many of their clients were Jewish; such as natural-living guru Philip Lovell and wife Leah; the German-Jewish painter Galka Emmy Scheyer; and the Pittsburgh Kaufmanns, patrons of the now-iconic Desert House. The professional and social world in which these architects and clients flourished had a strong German and New York Jewish presence. Historian Gavriel Rosenfeld has grouped Neutra and Schindler as “Non-Jewish” Jewish Architects: Profiles in Evasion;” in his book Building after Auschwitz: Jewish Architecture and the Memory of the Holocaust, but I think the situation is more nuanced; even simple encounters with their buildings made other Jews more modern, and thus modernism more Jewish." Los Angeles, CA. 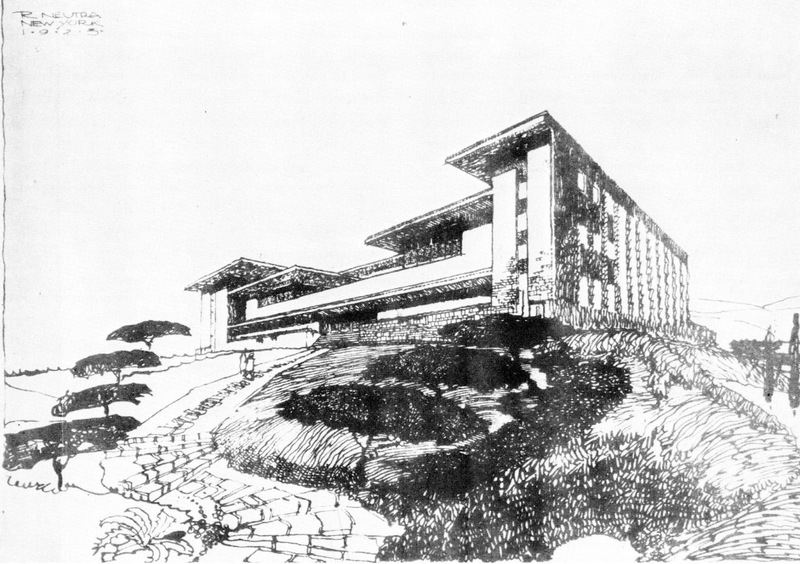 Lovell House,Richard Neutra, arch. 1927-29. Photo: Wikimedia.